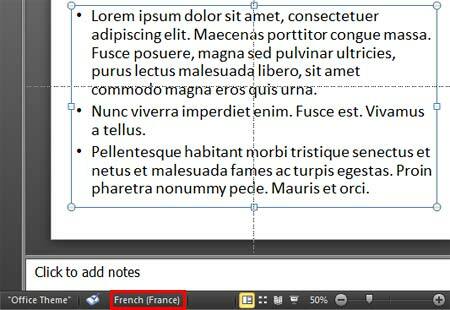 This PowerPoint tutorial explains how to make the Language Option visible on the Status Bar in PowerPoint 2010. Typically when you select any text container such as a text placeholder, shape, or text box -- then you may (or may not) see which language is specified for the text container on the Status Bar, as shown highlighted in red in Figure 1. You must have more than one Editing Language installed to see the Language option on the Status Bar. 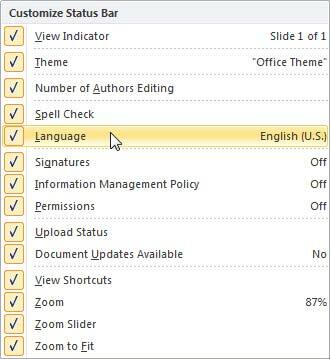 For more information on adding additional editing languages, please see our Add and Remove Proofing Dictionaries for Foreign Languages in PowerPoint 2010 tutorial. If you still do not see the Language option on the status bar, you may have turned that option off. To enable it again, you can right-click on an empty area of the Status Bar and make sure that the Language option is checked, as shown in Figure 2.